I love the fact that each candle warmer lamp and lantern come in three different colors: black, bronze and pewter! You can also choose to purchase them alone or as a combo that includes a candle in your choice of scent. Three (3) of Being Frugal and Making It Work’s Readers will WIN! This giveaway will end December 14th at Midnight EST. Disclaimer: I received complimentary candle warmers and scented candles from Candle Warmers for the purpose of writing a review and hosting a giveaway. Regardless, I only recommend products or services I use personally and/or believe will be a good fit for my readers. The views and opinions expressed on this blog are purely my own. Results may vary. No monetary compensation was received. These are so cute and I love smell good stuff! Win-win!! Can't go wrong with apple spice or cinnamon stick! I would choose their Home For the Holidays scent. 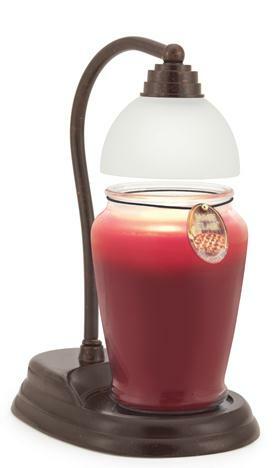 I really like the Ceramic Candle Warmer in Century Brown! I'd pick either Sweet Pea or Tropical Paradise! I'm torn between Apples & Spice and Cinnamon Sticks.